Interstate 795 branches southeast from I-95 at Exit 119 and accompanies U.S. 264 along the southwestern outskirts of Wilson. I-795 and U.S. 264 (Future I-587) separate at a wye interchange south of Wiggins Mill Reservoir. U.S. 264 continues east to Greenville while I-795 turns south along a rural freeway to the towns of Fremont and Pikeville. Paralleling U.S. 117 to the west, Interstate 795 reaches the north side of Goldbsboro at U.S. 70 Bypass (Future I-42). A cloverstack joins the two freeways adjacent to Lane Tree Golf Course. I-795 extends another 2.19 miles to U.S. 70 Business and North Carolina 581 just west of Downtown Goldsboro. Future I-795 corridor signs were posted by December 2017. This assembly stands just south of U.S. 70 along the connector to N.C. 581 in Goldsboro. Photo taken 12/14/17. I-795 north & U.S. 264 west advance 1.76 miles from N.C. 42 to Interstate 95 a short distance beyond the Wilson city limits. Photo taken 12/16/07. One half mile ahead of the full -cloverleaf interchange (Exits 38B/A) with Interstate 95 on I-795/U.S. 264 westbound. Photo taken 12/16/07. 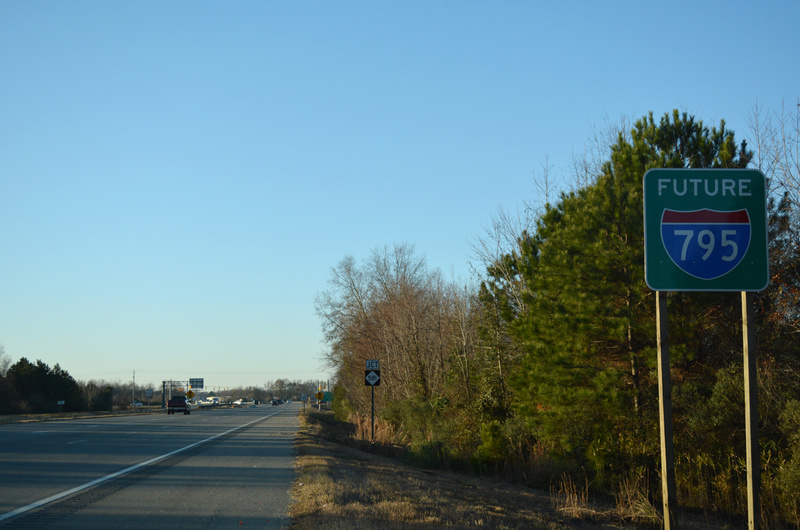 An end shield for Interstate 795 precedes the departure of Exit 38B for I-95 north to Rocky Mount, Roanoke Rapids and Petersburg, Virginia. Photo taken 12/16/07. Interstate 95 north connects with U.S. 64 (Future I-87) outside Rocky Mount in 19 miles and reaches Richmond, Virginia in 136 miles. Photo taken 12/16/07. Benson, the town where Interstates 95 and 40 cross paths, lies 40 miles to the southwest from Exit 38A. U.S. 264 continues west along Future I-587 to Zebulon, where it merges with U.S. 64 (Future I-87) en route to Knightdale and Raleigh. Photo taken 12/16/07. Interstate 95 angles northeast from N.C. 42 to converge with U.S. 264 (Future I-587) and I-795 south at a rural cloverleaf interchange west of Wilson. Photo taken 12/21/18. St. Rose Church Road spans I-95 one mile south of Exit 119 with U.S. 264 and Interstate 795 south. U.S. 264 comprises an intrastate highway between Raleigh and Manns Harbor. Prior to 2003, the route extended east along side U.S. 64 to Manteo and Whalebone Junction. Photo taken 12/21/18. A collector distributor roadway splits from the I-95 mainline for Exits 119A to Wilson / Goldsboro and 119B to Raleigh. The U.S. 264 freeway between Zebulon and Greenville was approved as Future Interstate 587 in 2016. Photo taken 12/21/18. Exit 119A departs the c/d roadway for U.S. 264 east to Wilson and Greenville and Interstate 795 south to Freemont and Pikeville. Photo taken 12/21/18. Interstate 795 travels south between a wooded area along Little River and the Winbon Acres community ahead of Exits 25A/B with U.S. 70 (Grantham Street). Photo taken 12/16/07. Separate ramps connect the south end of I-795 with U.S. 70 west toward Smithfield and east to Downtown Goldsboro. Completion of the U.S. 70 Bypass (Future I-42) freeway to the north serves through traffic around Goldsboro between Raleigh and Kinston. Photo taken 12/16/07. The I-795 freeway extends another 0.62 miles from the U.S. 70 underpass to N.C> 581 at Ash Street. Photo taken 12/16/07. U.S. 70 (Grantham Street) navigates through succeeding parclo interchanges westbound from Downtown Goldsboro to Interstate 795. The initial exchange connects Grantham Street with U.S. 13/117. I-795 follows northward from N.C. 581 to U.S. 264 at Wilson. Photo taken 12/14/17. Interstate 795 extends north from an expressway linking U.S. 13/117 with N.C. 581 at Ash Street. The rural freeway travels from Goldsboro to Pikesville, Fremont and Black Creek. Photo taken 12/16/07. U.S. 13/117 north separate with N.C. 581 just ahead of Ash Street. U.S. 13/117 follow an older freeway (former U.S. 117 Bypass) around central Goldsboro while N.C. 581 leads directly to Interstate 795. Photo taken 12/16/07. Beyond the signalized turn of N.C. 581 west onto Ash Street, the freeway for I-795 commences northbound leading into the exchange with U.S. 70 (Grantham Street). Photo taken 12/16/07. The unnumbered ramp for U.S. 70 departs from Interstate 795 for Grantham Street east into Downtown Goldsboro and U.S. 70 west to Smithfield and Raleigh. U.S. 70 Bypass (Future I-42) converges with U.S. 70, 4.7 miles to the west. Photo taken 12/16/07. NC Application for I-795 Rejected (For Now) posted by Robert Malme on Southeast Roads at Yahoo!Groups (May 15, 2007). “U.S. 117 gets OK to allow trucks.” Goldsboro News-Argus (NC), October 2, 2007. “A new interstate connection between I-40 and I-95 is in the works.” The News & Observer (Raleigh, NC), November 28, 2018.